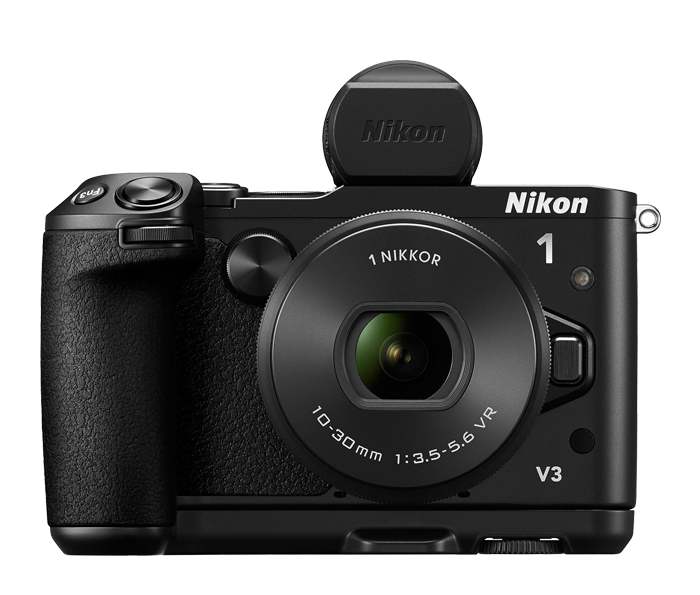 Introducing the new Nikon 1 flagship, the Nikon 1 V3, a thrilling camera that combines the portability of a compact camera and image quality and capabilities usually associated only with a D-SLR along with game-changing speed and accuracy. An enhanced 18.4-MP image sensor is paired with Nikon's new EXPEED 4A image processor to achieve the world's fastest continuous frame rate*, brilliant low-light performance and cinema-quality video capabilities. Add an ultra-fast autofocus system, the convenience of built-in Wi-Fi® for sharing photos and controlling the camera with a compatible smartphone or tablet and compatibility with both 1 NIKKOR lenses and legendary NIKKOR F-mount D-SLR lenses (with the optional FT-1 Mount Adapter**), and the Nikon 1 V3 is a D-SLR owner's dream come true. When it comes to capturing sports, fast action and other spontaneous moments that demand fast performance, the Nikon 1 V3 is second to none. Nikon's CX-format CMOS image sensor is one of the most exciting innovations in image sensor design and the secret behind Nikon 1's unrivaled speed, image quality and elegant design. The Nikon 1 V3 pairs an enhanced 18.4-MP CX-format CMOS image sensor with Nikon's new EXPEED 4A image processor for spectacular detail and colour rendering, blazing-fast speed and brilliant low-light performance. Shoot sharp, clear, noise-free photos and videos up to ISO 12,800—continue shooting in fading light long after lesser cameras have been put back in their cases. Bring the Nikon 1 V3 everywhere you go, and preserve important moments beautifully. The Nikon 1 V3 delivers exhilarating performance that will invigorate your passion for photography. Its tilting touch display has virtually zero lag, making it easy to shoot at unusual angles. Its high-end design is so streamlined and comfortable to use, you'll bring it on every outing. For those who like D-SLR-style shooting, add the optional GR-N1010 Camera Grip* and DF-N1000 Electronic Viewfinder* and feel right at home with the Nikon 1 V3. If you already own NIKKOR D-SLR lenses, add the optional FT-1 Mount Adapter* and use them with the Nikon 1 V3! (The camera's 2.7x crop factor will extend the reach of telephoto lenses—turn a 300mm into an 810mm!) Whether it's a companion to your D-SLR or the centrepiece of your photography system, the Nikon 1 V3 is a camera that's hard to put down. Your smartphone or tablet will be your favourite accessory for the Nikon 1 V3. Install Nikon's free iOS or Android app and watch the outstanding photos you take with the Nikon 1 V3 appear instantly on a compatible smartphone or tablet± for easy sharing by text message, email or uploading to your favourite site. Share every brilliant view—instantly! For self portraits and group shots that actually include you, use your smartphone or tablet to control your Nikon 1 V3—see what the camera sees and take photos.